The reservoir that helped turn Lewiston, Idaho, into into one of the country’s most unlikely West Coast port cities is filling up with sediment. Federal environmental agencies are turning to an unlikely monitoring technology to better understand the sources of sediment upstream. The navigational structures built into the Lower Granite Dam, completed in 1974, opened Lewiston to oceangoing vessels traveling up the Snake River. At 465 river miles away from the Pacific, that made Lewiston the country’s farthest-inland West Coast port. Since the dam was finished, around 75 million cubic yards of sediment have accumulated in the reservoir, according to Molly Wood, a surface water specialist with the U.S. Geological Survey’s Idaho Water Science Center. All that sand, silt and clay is filling in the reservoir’s navigational channel and reducing the reservoir’s capacity to mitigate flooding in Lewiston and nearby Clarkston, Wash. The U.S. Army Corps of Engineers has periodically dredged the channel to ease ship passage, and is proposing to do so in the near future. But the agency is also beginning to consider taking measures farther up the watershed to control sediment before it gets to the reservoir. Before the Corps can plan control efforts upstream, they’ll need a better understanding of just how much sediment is flowing into the reservoir from tributary basins like the Snake, Clearwater and Salmon river systems. But that calculation carries an extra degree of difficulty in this part of the country. A standard method for estimating how much sediment a river carries is to collect a series of sediment samples and relate those concentrations to streamflow at a stream gauge. “In some places, that works well,” Wood said. But not here, where the mix of dammed and free-flowing rivers complicates the relationship between flow and sediment. To overcome that hurdle, the Army Corps and USGS launched a study that sought a solution in a variety of water monitoring instruments that, while not measuring suspended sediments directly, might prove a reliable stand-in. Among the instruments they tested was an acoustic Doppler velocity meter, or ADVM. ADVMs are traditionally used to measure stream velocity, not sediment. But the instrument calculates velocity by sending a out sound wave that bounces off of particles in the water, including sediment. While the returning signal is used to compute velocity, the instrument also reports the strength of the returning signal, a parameter known as backscatter. 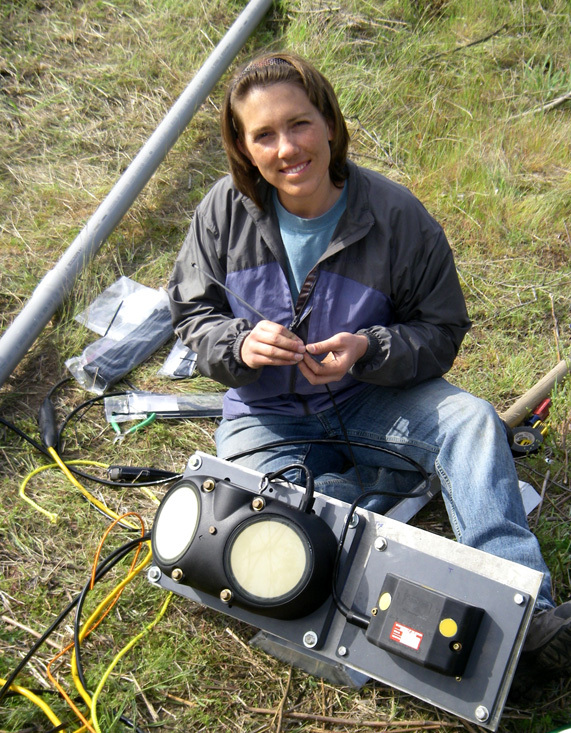 In 2008, Wood and other researchers installed ADVMs in the Snake and Clearwater rivers upstream of the Lower Granite Reservoir, where they measured backscatter every fifteen minutes. By relating those measurements to sediment concentrations in water samples collected around the same time, the researchers could develop models to convert the instrument’s real-time backscatter readings to fairly accurate sediment estimates. This research will help monitoring whether long-term strategies to control sediment farther up the watershed are effective, Wood said. But, the Corps’ short-term plans for managing sediment in the reservoir will likely include dredging the shipping channel. Meanwhile, there is a push to try to do this type of monitoring nationwide.